Donations continue to come in for our annual Farm Aid Charity Auction. Looks like we are going to have some cool items to auction off this year! We will get the auction up around the first week of September so if you would like to donate something to be auctioned off for a great cause send it our way! Yep, its that time of year again! Our Club Cherry Bomb/Human Wheels Farm Aid 2010 Charity Auction is starting to get under way! Last year we had some great donations! 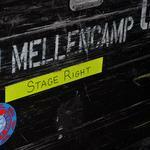 Fans from all over donated some of their prize Mellencamp merchandise to this great cause! No donation is to small. A sticker, a button, a shirt, whatever it is we are thrilled to have it be part of our auction! Last year we donated an incredible amount of money and John and the Farm Aid staff just can't thank you enough! Did you know that WE ARE THE ONLY FAN CLUB THAT DOES THIS! Not Willy's, not Neil's or Dave's ONLY JOHN'S! So let's all come together look in our closets, check those boxes of Mellencamp merch, see what we have that you can part with! And donate it to a great cause!